Come and see super-large Christmas tree made of 1,000 poinsettia plants in Akita Prefecture! AKITA, Dec. 18 — The display of an enormous Christmas tree made of locally-grown poinsettia plants began at Brume Messe Akita, drawing the attention of visitors to the public roadside complex in Katagami city, Akita Prefecture. 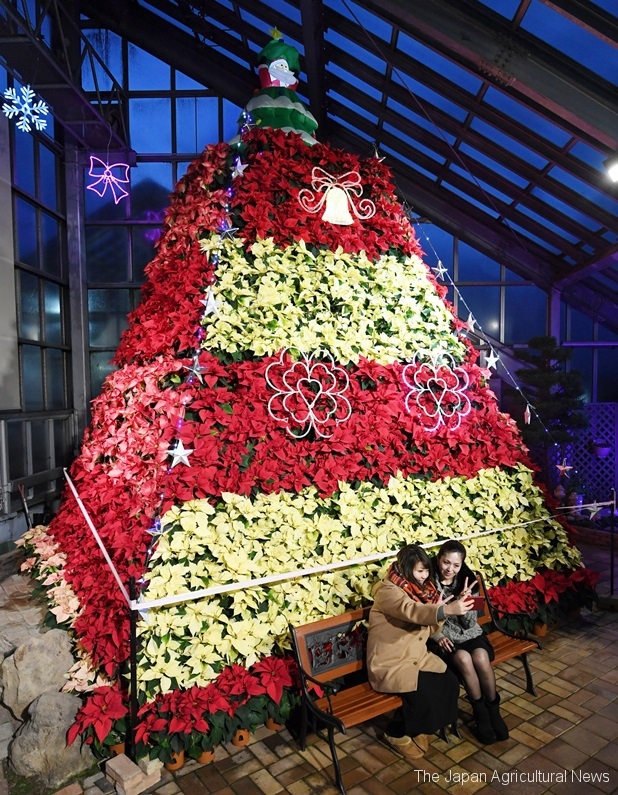 The 5-meter tall tower of the poinsettia is now on display in a greenhouse in the Prefectural flower and seedling center in the complex. It uses approximately 1,000 pots of poinsettia plants sourced from local farmers, and the pots are fixed into the holes in a frame made with latticed panels. The display of the poinsettia Christmas tree began approximately 20 years ago. The tree this year was created on December 2, using three varieties of poinsettia, and successfully inviting as many as 2,000 visitors a day. The greenhouse is open to the public from 9:00 a.m. to 6:00 p.m. No entry fee is required. The tree is lit up after 4:00 p.m. The tree display will continue until late January.